The Star-Ledger visited the Pequest Hatchery during stocking to film the large trout being loaded onto the stocking trucks. 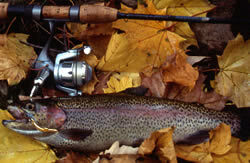 Check out the video at the following link, and don't miss out; go trout fishing this fall or winter - http://videos.nj.com/star-ledger/2008/10/bigger_trout_for_the_fall_seas.html. 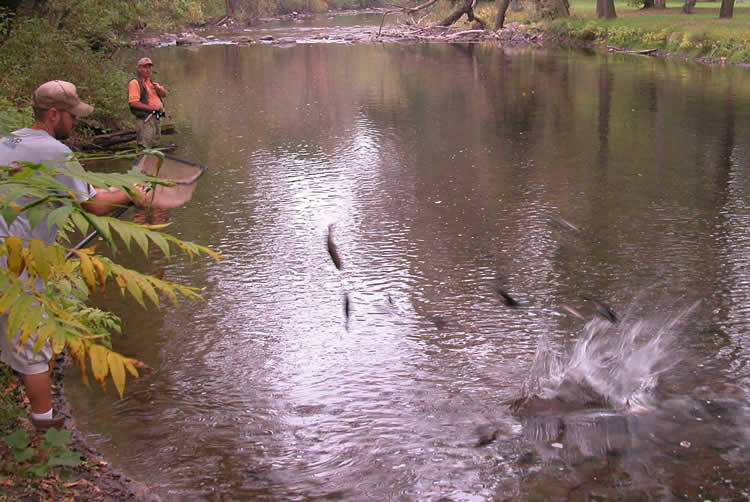 2010 Fall Trout Stocking Schedule Trout Fishing Facts & Information (When, Where, How) (pdf, 18kb)A growing number of New Jersey trout anglers now eagerly await the fall trout season. One reason is that since 2006, all of the trout stocked in the fall measure 14 inches to 24 inches and weigh one and a half pounds to eight pounds. The big fish, cool water, great weather and spectacular scenery combine to make the fall season what many consider to be New Jersey’s premium trout fishing season. And it doesn’t end with fall; hot trout fishing action extends through the winter months until the spring season begins again in April. This year fall stocking begins Tuesday, October 5 and continues through October 13. Over this period a total of 21,000 trout averaging 14 to 16 inches, and weighing 1½ - 2 pounds and 1,000 exceptionally large broodstock trout, measuring 17 - 24 inches, and weighing 3 - 8 pounds, will be distributed in 16 streams and 16 lakes and ponds statewide. All trout are raised at the division's Pequest Trout Hatchery. Waters stocked during the first week of fall stocking are the 16 large streams and rivers in northern and coastal areas, such as the Big Flatbook, Pequest River, South Branch Raritan River, Musconetcong River, and the Manasquan and Tom's Rivers. All fall-stocked waters may be fished as soon as they are stocked (no "closed waters" during fall stocking). There are no closed days during fall stocking. During the second week, 16 ponds and lakes in the central and southern portions of the state were stocked. Some of the more popular waters are Farrington Lake, Oak Pond, Greenwich Lake, and Mary Elmer Lake. The complete list of fall-stocked waters and the stocking schedule is available at www.njfishandwildlife.com/flstk.htm or through the Trout Stocking Hotline 609-633-6765. If you need help finding one of these trout-stocked waters, refer to the list of fishing access locations linked below for driving directions. 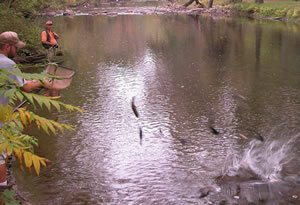 Other waters offer fine trout fishing opportunities even though they are not stocked in the fall. The Holdover Trout Lakes, like Lake Aeroflex and Lake Wawayanda, provide year round trout fishing opportunities. The landlocked salmon stocking program at these two lakes, now in its 3rd year, is starting to yield harvestable size salmon (12 inches). Our two Trophy Trout Lakes, Round Valley and Merrill Creek Reservoirs, are also great trout fishing destinations. 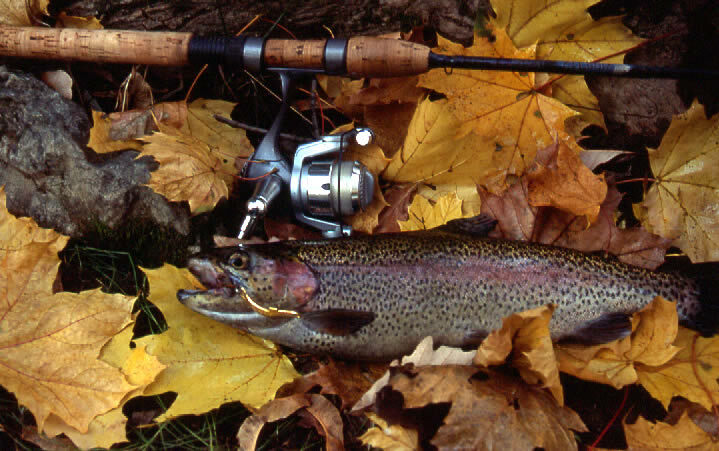 Shoreline fishing on Round Valley is particularly popular in the fall, as big rainbows cruise the shallows (See the current Freshwater Digest for special area regulations.) Also, sea run brown trout begin returning to freshwater in the Manasquan River during the fall and early winter. A distinctly different trout-fishing experience awaits anglers who fish the wild trout streams scattered across north Jersey. These small streams are not stocked with trout and anglers can expect to catch small, colorful trout, with most measuring less than ten inches. Thirty-six streams are managed under special regulations to provide anglers with opportunities to catch stunning, stream-bred trout (see the current Freshwater Digest for information). All trout captured from designated Wild Trout Streams, from September 16, 2010 to April 9, 2011 at 8 a.m. must be released, and be sure to leave the bait buckets home - these streams are artificials only.